Supreme Court Justice Ruth Bader Ginsburg does not fancy a Donald Trump presidency. In fact, in characteristic outspokenness, she recently remarked that she could not fathom what the United States would become were he elected. Many admire Ginsburg’s candor—her bracing intellect makes it especially thrilling—but others are aghast that, as a member of the Supreme Court, she speaks so freely about her political leanings. The prevailing concern is that Ginsberg could not be viewed as impartial as someone in the position to strike down presidential policies. But then, it’s not difficult to discern many of the justices’ political inclinations. Like Ginsburg, Scalia was especially outspoken about his views. Justice Clarence Thomas is a known conservative, and his wife openly endorsed Senator Ted Cruz in the Republican presidential primary. Justice Elena Kagan has worked for both the Clinton and Obama administrations. But Ginsburg is undeterred. And while she gives no inclination of stepping down from the Court anytime soon, she acknowledges—with a sly twist—that there may be vacancies before long. She is the oldest justice, but Anthony Kennedy and Stephen Breyer will both be 78 by the January 2017 inauguration. “It’s likely the next president, whoever she will be, will have a few appointments to make,” Ginsberg tells AP with a smile. Here’s hoping that she’s not alluding to herself. 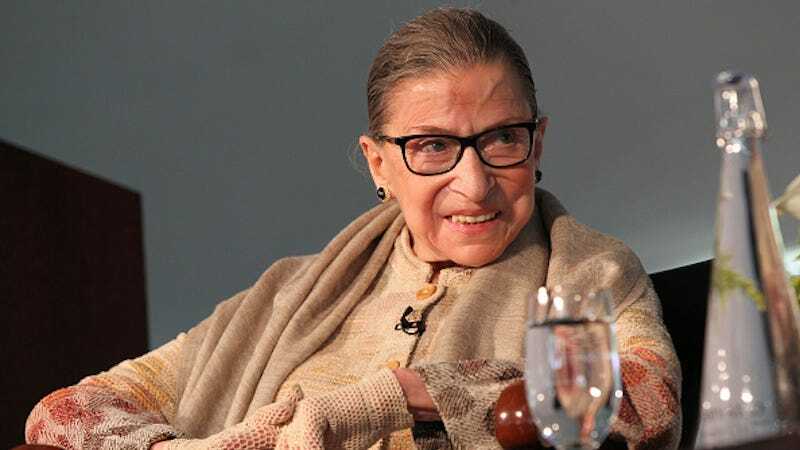 After all — a Supreme Court sans the Notorious RBG? Who could possibly fathom that?